03 | March | 2011 | WHAT A FEELING! 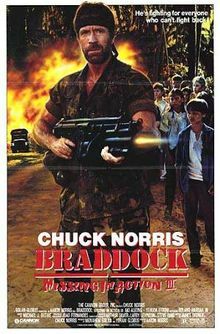 The Missing in Action films have given Chuck Norris his brawniest character (and his steadiest work): James Braddock, the ex-Vietnam vet who keeps returning to Vietnam, mowing down Communists, and bringing innocents back. Braddock: Missing in Action III adds a new element to the series. A prologue, set in 1975, informs us that Braddock had a Vietnamese wife. (This fact, as far as I can remember, was hitherto unmentioned in the series.) At the time of the American withdrawal from Saigon, Braddock thought his wife had been killed, and he left without her. Twelve years later, he learns that, not only is his wife alive, but she was also pregnant at the time of their parting. She has since given birth to a son. Devotees of Norris’s cinema will have already guessed that he hops the first plane to Bangkok and finds a way to cross the border into Vietnam, but getting his wife and son out proves harder than getting in. The obstacles include an unexpected truckload of kids (they must be evacuated too), sadistic torture, and seemingly hundreds of enemy soldiers. All of the latter are blown to smithereens. MIA III is no better or worse than the preceding films in the series. The Saigon prologue works up some convincing panic, even if most of it is stolen from The Killing Fields. On the whole Aaron Norris directs with full-bore simplicity, though the film contains no killer effects such as the burlap bag full of live rats that was tied around Chuck’s head in MIA II. Someday some film student is going to write a dissertation about the Missing in Action films. In some unconscious ways, despite themselves, these are interesting movies—the way in which, for instance, Braddock’s existence in the United States is absolutely perfunctory, as though he were alive only to relive the war experience. If some veterans keep returning to Vietnam psychologically, Braddock actually acts out the return. And, to paraphrase Sylvester Stallone in Rambo, this time we win. At this point Braddock’s invincibility has gone beyond ludicrousness. He’s a superhero who doesn’t even bother dodging bullets; they magically avoid him. It’s another level of wish-fulfillment at work in these films, and like most superhero stories, it’s effective. And so it went. Interesting to register that this was only a dozen years or so after Saigon fell, and still fresh enough to be talked about this way. You are currently browsing the WHAT A FEELING! blog archives for the day Thursday, March 3rd, 2011.